Dreams are the language of the unconscious mind, unique to each individual. The Swan Coach House Gallery presents an exhibition of three emerging artists who process their waking lives through a prolific free-flow of imagery. Each demonstrates a painting and drawing practice that acts like dreaming, mixing abstract and literal elements into distinct personal styles of expression. Addison Adams’ painterly and playful abstractions are oddly figurative,but cleverly smeared beyond recognition. Larger paintings are informed by cartoon-like sketches of bodies and objects. Often, a storyboard element appears at the bottom of his artworks, with fuzzy linear squares denoting a hidden narrative. Intense, emotionally sensitive, and excited about art, Chris Deriso is always channeling work. Like an “outsider” or “visionary” artist, he states that he co-creates with his imagination, allowing imagery to flow through him from some other place. As an artist who has recently come out as transgender, Nico Marulanda works out fantasy, fears, and personal freedom on paper. Her art-making functions as a safety zone of watery aesthetics, mysterious narratives, and serenity. Our annual winter exhibition showcasing hundreds of small works made by emerging and established local artists, priced for the holidays. 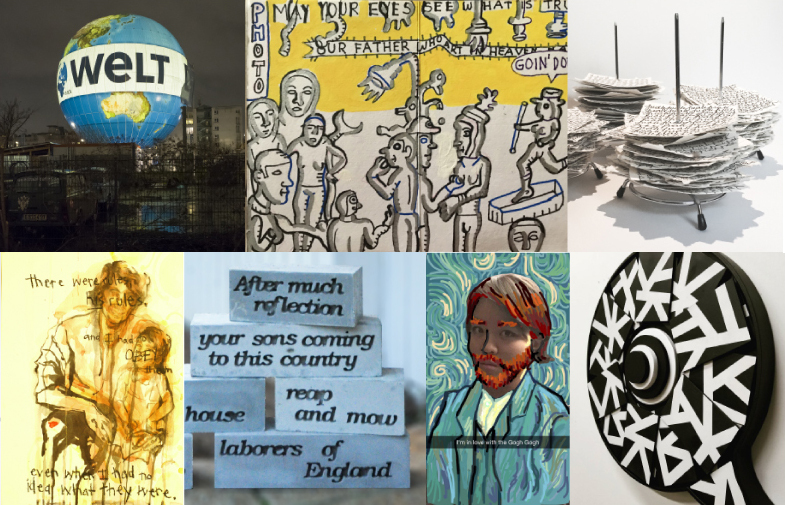 ARTISTS: Lisa Alembik, Steven Anderson, Linda Armstrong, Maria Artemis, Rose M Barron, Melissa Basham, Laura Bell, Scott Belville, Khalilah Birdsong, Margaret Boone, Eileen Braun, Caroline Bullock, Lucinda Bunnen, Joe Camoosa, Angelyn Chandler, Gordon Chandler, In Kyoung Chun, Jon Ciliberto, Susan Cipcic, Ryan Coleman, Ande Cook, Taylor Cox, Lucy Currie, Elyse Defoor, Terri Dilling, Craig Drennen, Scott Eakin, Sarah Emerson, Sabre Esler, Amie Esslinger, Cynthia Farnell, PJ Floyd, Gail Foster, Steve Frenkel, Eula Ginsburg, Ben Goldman, Barry Gregg, Gwen Gunter, Hayes Hamilton, Richard Harris, Dana Haugaard, Kris Hill, Roxane Hollosi, Tim Hunter, Anna Jensen, James Jernigan, Susan Ker-Seymer, Wihro Kim, Chase Wilson King, George Kroenert, Judy Lampert, Jack Lawing, Michelle Laxalt, Lori Lejeune, George Long, Allison Luce, Alaina Lyle, Rob Matre, Bill Mayer, Erin McIntosh, Birgit McQueen, Katherine Mialkowski, Donna Mintz, Katherine Mitchell, Linda Mitchell, Dana Montlack, Paul Muldawer, Eleanor Neal, Barbara Olsen, Ann Otterness, Jeffrey Paclipan, Erin Palovick, Lainey Papageorge, Judy Parady, Joe Peragine, Iman Person, Joy Ballard Peters, Junco Sato Pollack, Elizabeth Porcel, Paige Prier, Tony Raffalovich, Adrina Richard, David Robinson, Paul Rodecker, Lucha Rodriguez, Stacie Rose, Stephanie Scott, Lisa Shinault, Matt Simmons, Laura Shull, Erin Sledd, Whitney Stansell, Susan Starr, Ann Stewart, Richard Sudden, Tom Swanston, Katherine Taylor, Zipporah Camille Thompson, John Tindel, Karen Tunnell, Lisa Tuttle, Vasil Vasilev, Igor Vavrosky, Aila Wartell, Catherine Wilmer, Stella Wissner, Jamele Wright, Sr. This collaborative project by artist David Baerwalde and fashion photographer Alex Martinez is presented in conjunction with Atlanta Celebrates Photography 2018. Presented are altered photographs which have been torn, taped, and repaired after the removal of the original subjects. Martinez provides out-takes from his professional photo shoots, which are then printed for Baerwalde to work with in a collage-like manner. The two edit from the resulting new artworks. The best results are re-photographed and re-printed as minimal landscapes with mysterious disappearances and “cover-ups.” Nature is so often used as an attractive backdrop for models promoting products. Here, the artists attempt to recapture a certain lost beauty and idealism from before the commercial age. This exhibition presents Junco Sato Pollack’s Sky Cloud and Kinhin series. These series are inspired by the Zen spiritual practice of Sutra chanting and internalized stitching as meditation. Pollack finds the repetitive action of chanting and stitching to be a metaphor for Sutras, Mantras, breath, life force, and meditation. “When extended over time, stitch-by-stitch and layer-by-layer, these actions transform into artwork depicting a complete universe, micro- and macro- energy fields, and the mindscape,” states Pollack. The resulting work reveals joyous, spontaneous and unaltered traces on textile substrates: that of mind-thought imprints; that of pure contemplation over time and space; and that of electro-magnetic energy mapping. It is her intention that the exhibition will invite contemplation and a still mind, as a Zen master might say, "as still water of a pond reflects the sun and the moon." The Summer Swan Invitational has been a popular annual exhibition at the Swan Coach House Gallery since 2011, selling art that is beautiful, usable and affordable. This year's exhibit has a new curator, Karen Tauches, who incorporates a few favorite participants from the past and adds some fresh, new blood. In Be Not Afraid, Andrew Boatright exhibits a sculptural installation in which he presents his first ever work of life-size, figurative sculpture. Departing from his use of abstract gestures and forms, this new approach directly expresses the personal and theological underpinnings latent in his previous work. Through the image of the crucifixion, Boatright focuses directly on the archetypal Christian image of suffering and humiliation. His present work gives focused attention to the idea of “self-emptying” as a means to new life. Therefore, the giving over of life at the moment of death is, paradoxically, the means through which new life is given. The title of the show is meant to provide viewers with a hopeful lens through which to view the work, and an affirmation of the radical power of powerlessness. Boatright’s sculpture is a contemporary take on historical imagery where the marginalized, oppressed and weak are symbolically present in the broken body of Jesus. Art is a visual language. Its aim: to communicate. BEYOND WORDS explores how artists combine images and words to produce thoughts and feelings not generated by either alone. There is a space between the two that offers possibilities and inspiration to the artist where words are a catalyst for visual expression. Combining written text with images has a long history in art. This exhibition pushes the boundaries for viewers accustomed to finding meaning in visual images and for artists who use words as inspiration, commentary, design and poetic dialogue. A group exhibition reflecting an urban landscape under heightened development. Hundreds of small, collectible works by a wide range of emerging and established artists from the community, just in time for the holidays. This mid career retrospective of Beth Lilly’s photographic projects reveals her dark humor as she tells stories about the past and speculates on humanity’s future. Hundreds of Small, collectible works by a wide range of Emerging and Established Artists from the community, on sale for the Holidays. The stereoscopic landscapes and portraits in “VENT” are a photographic response to the heat and pressure felt today on a personal, political and planetary level. Bermans, a reknowned family of Georgia potters–Rick, Jennie Ashcraft, & Jorie. Humor has long been a part of the culture and character of the Cuban people and is used as a form of coping with their oppression. The images in this exhibition are amusing and reflective rather than mocking or ironical. They are tools of communication that Aguilera produces everyday since leaving his homeland. Viewers were invited to experience the fascinating differences between photographic prints and video. This exhibition took place at theGallery and the Historic Swan House at The History Center. Gallery Artists: Morgan Alexander, David Baerwalde, Benita Carr, Amanda Greene, Courtney Egan, Jody Fausett, Audrey Hynes, Sarah Hobbs, Bill Orisich, Christina Price Washington, Jessica Scott Felder, and Steffen Sornpao. Featuring hundreds of small works by established and emerging artists from the Southeast! 2014-2015 Emerging Artist Award Winner Amandine Drouet produced an entire body of work made from this disregarded material; All of it gathered locally from her neighborhood and friends. Aware of plastic’s negative impact on the natural environment, the artist hopes to raise awareness and encourage attitudes of re-use. Work from Finalists Jessica Caldas, Chris Chambers, Henry Detweiler, and Chantelle Rytter were also on display. Featuring: Carolyn Carr, Carolyn Caswell, Shannon Candler, Grady Clinkscales, Grady Clinkscales Jr., Betty Edge, Mary Croft Ferguson, Greg Ferguson, Jean Glenn, Wanda Hopkins, Dixie Purvis, Karen Tauches, Ansley West Rivers. Presented were images and texts regarding the gifts the Forward Arts Foundation gave to various Atlanta Art Insititutions since its inception (High Museum, Michael Carlos Museum, Botanical Gardens, Beltine, MOCA GA, the Atlanta Contemporary Art Center. Etc). Additional information was provided about the Orly Crash and the connection between the Forward Arts Foundation and the High Museum. This exhibition is the second in a series of three that honor the work of Atlanta photographer, philanthropist, and art collector, Lucinda Bunnen. Beyond her interest in collecting art, Bunnen is a prodigious collector of many things. Presented here were a series of 27 photographs that she created which assemble and document some of her many collections. artists, as well as discover new emerging talent. Curated by Marianne Lambert. Reflecting on the concept of DNA as a code of life, Ginn explores the idea of drawing as code. Her multimedia installation reveals the process of repetition and mutation, by which drawing is recoded into sculpture, sculpture into drawing, drawing into video, and installation into photography. Roger’s nature-based work is strongly influenced by Botanical Illustration, Art History and Anthropology. Paintings, drawings, sculpture and installation of botanic imagery are conceptually based on the deconstruction of relationships, events, and personal moments. Her work examines the relationships between people, plants, and place.